New Caledonia's starting line-up for the second of two friendlies. 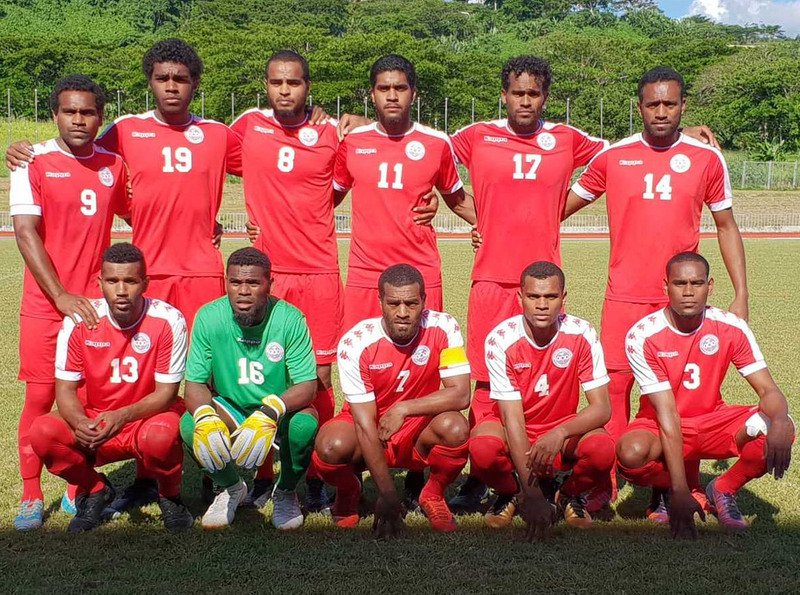 After a narrow 1-0 victory over Vanuatu in the first international friendly in Port Vila, Vanuatu hit back late in the second half of Saturday’s encounter to secure a 2-2 draw against New Caledonia at Korman Stadium. The first match took only fourteen minutes for New Caledonia to score the goal which would secure them the win. In his international debut Antoine Roine, the top scorer in the Super Ligue with 22 goals this season, didn’t take long to show his skills in front of goal. Accelerating past the defence to latch onto a cross from the left from Joseph Tchacko. New Caledonia continued to dominate the first half but despite a couple of credible chances, were unable to add anything further to their tally. Vanuatu came out of the changing room fired up and immediately put pressure on their opponents who were able to manage the midfield well courtesy of captain Joël Wakanumuné and Cédric Sansot. However Rocky Nyikeine, goalkeeper for Hienghène Sport in the Super Ligue, who proved his qualities by halting numerous chances with Bong Kalo causing the majority of problems. Vanuatu looked like they might get their chance to equalise when referee George Time awarded a penalty, towards the end of additional time however Auckland City FC defender Brian Kaltack’s effort ricocheted off the crossbar allowing New Caledonia to retain their lead. The second match was a much closer encounter with Vanuatu taking the lead in just the 5th minute courtesy of a penalty. Coach Thierry Sardo decided to make a tactical change early on, freeing up Wakanumunè to man-mark Bong Kalo who was causing a lot of problems with his speed and ability to break down the New Caledonian midfield. With a bit of control returned to their game, New Caledonia settled and were able to equalise in the 32nd minute when Roine was set-up by a perfect pass from young debutant Cyril Drawilo. Ten minutes later New Caledonia finally had the lead they sought when Geordy Gony met a corner delivery and buried it in the net. Vanuatu were able to launch a comeback late in the second half frustrating the victors no end as the home side denied their chance at a double victory.